There are 8 of them, 6 adults and 2 children. Do you see 2 child monkeys sticked to their mother monkeys in this monkey family picture? We took this photo in Bhangarh. We were not lucky to take this monkey family picture. 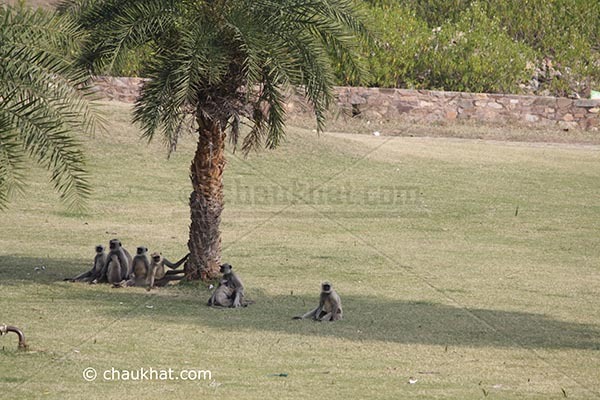 Yes, we were NOT lucky, because these monkeys were in uncountable number there. @ Geeta: Nice imagination :) Come over! I saw a monkey family at the next building's terrace after lunch today. It seemed like a joint family - relaxing, sleeping and playing. And I actually said to my colleague that I envy them for being able to enjoy the lovely sunshine in this dreaded winters! m finally back:):)hop u n chaukhat.com both r doin gud!! That's such a heart warming pic!! !